This is my new favorite roast chicken recipe. You start by rubbing the inside of a dutch oven with olive oil. Then a slice of bread is placed in the bottom of the dutch oven, a bed for the bird. A five pound chicken is seasoned inside and out with salt and pepper. Some sprigs of herbs and half a head of garlic are put in the cavity. The chicken is put on its bead along with some more herbs, a little oil and water and the other half of the garlic. Put it into a 450 degree oven for 45 mins. Then add some potatoes, shallots, carrots that have been tossed in olive oil. Continue roasting for 45 more mins. Paresseaux means lazy people. I'm glad to be one. This was another easy recipe from Dorie Greespan's around my french table. The French Fridays with Dorie group is baking their way through the delicious recipes. 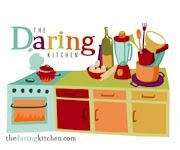 Linda and Dave of Monkeyshines in the Kitchen chose November's Daring Cooks Challenge . We were to make a souffle. Sweet, savory, it didn't matter. Years ago, I went through a souffle stage. At the end of it, I concluded that I don't really like souffles. I generally don't like really eggy dishes. Flan, quiche, meringue not really my favorites. However, a souffle is a wonderful canvas, lots of ingredients can be incorporated into them. I wanted to make mine from things that I had on hand. At some point, I gave away my ceramic souffle dish. Every so often I go through a decluttering kick. So I found myself without the perfect pan. I decided to make four individual ramekins from a three egg souffle for lunch. I sauteed some garlic in some butter. I added some flour, cooked it for a bit. Added milk and made a thick bechamel sauce. I seasoned it with salt and pepper. I let it cool for ten minutes. I added the egg yolks one by one followed by the cheese and basil. The egg white were beaten and then folded in. Folding always confuses me. Too much folding and the wonderful bubbles disappear. Too little folding and you have large streaks of cooked egg whites. A delicate balance is needed. I served it with some sliced tomatoes. A delicious lunch, the two souffles left on the counter quickly shriveled away. Because they are souffles. Beautiful for a moment only. I am enjoying cooking my way through Dorie Greenspan's around my french table. When the recipe suggestions for November's French Fridays with Dorie were posted, I knew that I could not vote for brussel sprouts. Evil little cabbages. My father grew them in our huge backyard garden. And they grew well. Towering trees of evil little cabbages. I think that the groundhogs and rabbits ignored them. We were a "clean plate" family. I happened to sit close to the trash can, during brussel sprouts season, little balls would roll across the table from my five siblings and I would quickly dispose of them and one of my brothers would hurry to empty the trash after dinner. Every so often, I will run across a brussel sprout lover. I am always surprised that they exist. I have tried brussel sprouts. They are attractive little balls, you would think that they should taste good. I have roasted them, steamed them, simmered them, pureed them. With the same conclusion. Evil little cabbages. Some how, I continue to find myself drawn to them. There they were in the grocery store, beautiful looking perfect balls. I bought them. Maybe this time I could find the right recipe. Then I remembered Dorie's recipe. This recipe was concocted by Dorie solely because the main ingredients were next to each other in the farmers market when she went shopping. Really, that is how it works for her. I was hesitant because I don't generally like sugar on my vegetables. I checked the ingredient list. I happened to have a butternut squash in the pantry, and granny smith apples had been on sale. I have a backyard full of sage. I always have brown sugar, salt, pepper and olive oil. I peeled and cubed some butternut squash, cut the evil little cabbages in half, cut up an apple and mixed it all together. I sprinkled the mixture with olive oil, salt and pepper. Put some of the mixture in the middle of tin foil squares, topped it with sage and the tiniest amount of brown sugar and popped it into the oven. I liked it. I amazingly liked it. I mean if I had a friend who was growing the evil little cabbages and came over to dinner with them, I have a recipe. This is a weight off my shoulders, at almost the half century mark I can clean those brussel sprouts off my plate! This is for one of those nights when you need to pull a delicious dessert out of a hat, or a box. It is from Southern Living, 2005 I think. Every time that I make it, people love it. It is one of the easiest recipes that I have. Mix the first 5 ingredients and pour into a lightly greased 13 x 9 pan. Sprinkle cake mix evenly over mixture. Sprinkle pecans, drizzle with butter. Bake at 350 for one hour. Remove and let stand for 10 mins. Serve warm or at room temp. Top with whipped cream if you'd like. This Friday's recipe for French Fridays with Dorie was Potato Gratin. What is not to love about potato gratin. Simple ingredients combined to make a bubbly plate of delicious goodness. Garlic and heavy cream is brought to a gentle simmer. Potatoes are sliced with a mandoline and arranged in a pan in overlapping circles. Each layer is sprinkled with salt and pepper and some warm cream. When the pan is filled, it is covered with shredded cheese. The gratin is baked for 45 mins and then allowed to rest while the potatoes absorb a little more cream. I am biased towards any dish made with potatoes. However, we have a favorite gratin that is made with grueyere and creme fraiche that is hard to surpass.